It can be hard to keep up any practice, especially at night when willpower is at an all-time low and the body wants to rest. I have found that when a practice is powerful enough, however, my mind and body can find a way. I have now been keeping up a nightly gratitude journaling practice for more than 3 months — and I intend to continue it. I first started the practice during Thanksgiving last year, after a seasonally themed gratitude class by Erika Rosenberg at the Nyingma Institute. Erika mentioned various studies where people’s positivity and general health increased while gratitude journaling, and recommended we try it ourselves. I’m a sucker for science-backed positivity boosts and for doing the extra credit in class, so I immediately started my own journal. I was also in the midst of a 4 month Buddhist retreat, so I had ample mental space to start practices and study their effects. For my gratitude journal, I decided to focus on feeling grateful towards people rather than things, because I was also working on my tendency to negatively judge others. I figured that I could counter the negative judgments conjured up by my mind by purposefully conjuring up positive judgments as well. Anecdotally, it works! 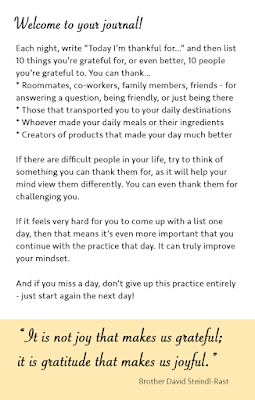 To encourage friends and family to start a gratitude practice, I made them journals for Christmas by pasting the instructions below (PNG, PSD) on the inside cover of little notebooks. As with any practice, I encourage you to experiment with the format and see what is most effective for you. I wish you well on your journey.